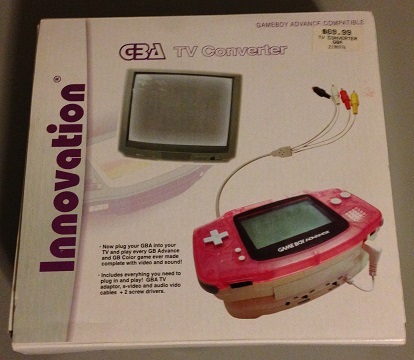 This section shows how to install the Innovation TV adapter into your GBA. It’s a pretty complicated mod, so I’d only recommend it to GBA enthusiasts who have good soldering skills. After you’re done, you’ll also have to modify the adapter for higher-quality RGB output, however it’s sadly outputting interlaced 480i instead of progressive 240p. As an FYI, there’s also a “GBA Transverter” available. Its output is about the same, but the installation is different. – Steady hand and excellent soldering skills. I must insist that I DO NOT recommend using the original installation method, as you’ll get terrible video quality! Allow me to explain: The GBA TV kit comes with a push-on cable for the video connection. You’ll notice that it simply lines up the pins to the ones on the GBA’s video out cable. There’s nothing holding them together, other than the pressure of the connection. I think this was a terrible way to make the connection. I’ve installed a few of these on both 32 and 40-pin GBA’s and all had poor video output as a result of a bad connection. Once you’ve installed the TV adapter into your GBA, you can modify the adapter to output RGB instead of S-Video or Composite! Just follow the instructions in that link and you’ll have a completely modded, RGB-outputting GBA!! If you’d like to see how this mod compares to the other GBA – TV options, please check out the comparison page. If not, click here to head back to the main GBA page.